Welcome! The 1Million Project Foundation is so glad that you are participating in the 1Million Project! This resource page was created to assist all 1Million Project schools with successfully implementing the program. Thanks again for your commitment to your students and for your partnership in helping to close America’s Homework Gap. Welcome to the 1Million Project! First Things First. The beginning of your Implementation Journey is highlighted by receiving your welcome letter, as well as an email from your Implementation Lead and an invitation to the Welcome Call. Keys to success include electronically signingyour Terms & Conditions (found in your official welcome letter); attending one of the upcoming Welcome Calls (please invite all dedicated school resources to one of these calls as well); and confirming all of your local school points of contacts. During this phase you’ll undertake the important work of creating program awareness within your high schools and identifying eligible students. We’ve learned from working with hundreds of districts that, even though the 1Million Project is free, it can be challenging to secure buy-in from eligible students. This collection of specific resources will help you address this challenge. Please engage in these efforts during the month of April. We trust you’ve attended one of the 1Million Project’s Welcome Calls and are now ready to move to the next phase of the implementation journey. Each school location is required to hold one or more Activation Events at the beginning of the 2018-19 school year during which school staff will activate and distribute devices to eligible students. To facilitate the device activation process, we have developed an online Device Management Portal. This portal is where schools will activate devices, suspend/cancel accounts, pull student reporting and more. Included here are step-by-step training materials that will prepare school staff on how to use the online portal in order to provide the device support students will need throughout the school year. 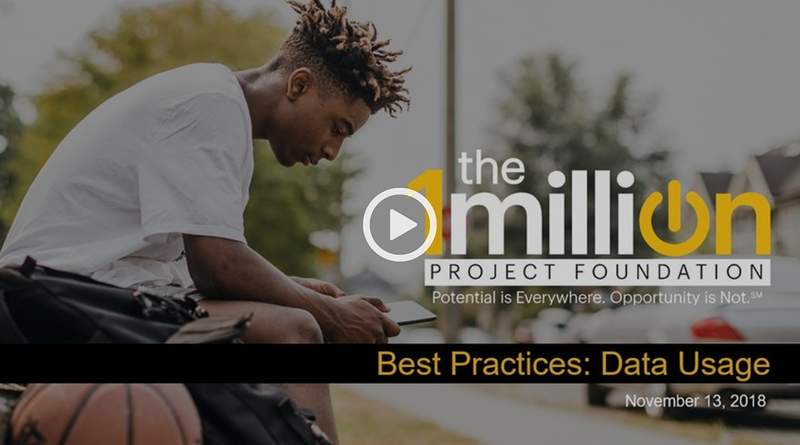 Critical to the 1Million Project is our gaining clarity on the impact we're having on students ability to achieve their full potential, and teachers' ability to support them in that endeavor. Through several surveys and a randomized, research study by researchers at Columbia University, we hope to gain critical insights from students and administrators that will help us deepen our impact. In this section you'll find PDFs of our annual administrator and student surveys, as well as key information about Columbia University's study with select 1MP districts as we seek to better understand our impacts on key student attitudes, behaviors and performances. The 1Million Project Foundation is committed to assisting you with any technical issues or questions that may come up while in the 1Million Project. Here you will find a variety of resources to assist with device activations and general account maintenance. The contact information provided below is only for schools or districts to use and should not be given to parents or students. If your question relates to anything other than what’s listed above, you will need to call Care at 844-689-3934. If you don’t know how to access the Device Management Portal, please contact your local school administrator first and then your implementation lead if the school is unable to address. If you get locked out of the Device Management Portal after too many attempts to log-in, please contact your local school administrator first and then your implementation lead if the school is unable to address. If you have general reporting questions. If you have any general device and/or shipment questions. The 1Million Project Foundation is a Section 501(c)(3) charitable organization. Federal Tax ID 82-2640564. 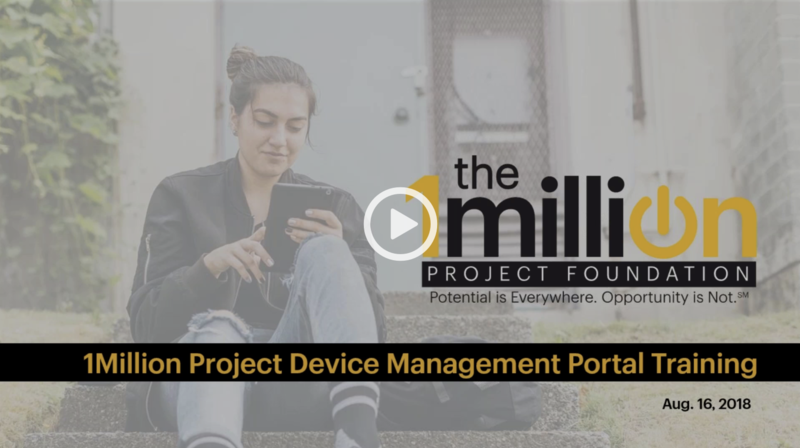 The 1Million Project Foundation will use donations to support the 1Million Project, which may include purchasing new devices (smartphones, tablets, hotspots), providing educational resources, administering the program and funding program training for eligible high school students. The 1Million Project Foundation is a separate legal entity from Sprint. Cash donations to the 1Million Project Foundation are tax deductible.